Further information, construction photos and technical information is available here (WorldsBrightestBikecopy) on a page that has pictures but is not linked to my site. 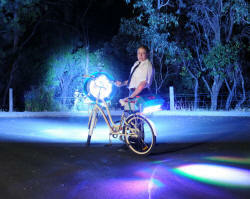 My public page (WorldsBrightestBike) is a identical (but has photos removed). I can provide higher res copies for all the pictures on these pages. +61 418 939 886 or +61 8 9795 6097. I usually work up after midnight so late here is better. 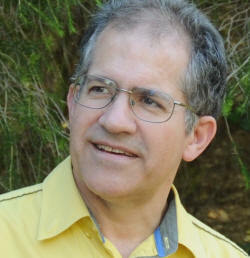 Meet Dr Peter Terren from Bunbury, Australia. A mild mannered medical specialist by day, by night he becomes an eccentric physics boffin. His high voltage antics and particularly his unusual electrical Christmas trees have been seen in media around the globe. This year he has turned down the voltage but turned up the brightness. His latest creation, he claims, is the World's most powerful bicycle lights. At around the same brightness as 10 standard car headlights, it is far too bright to be allowed on the road. 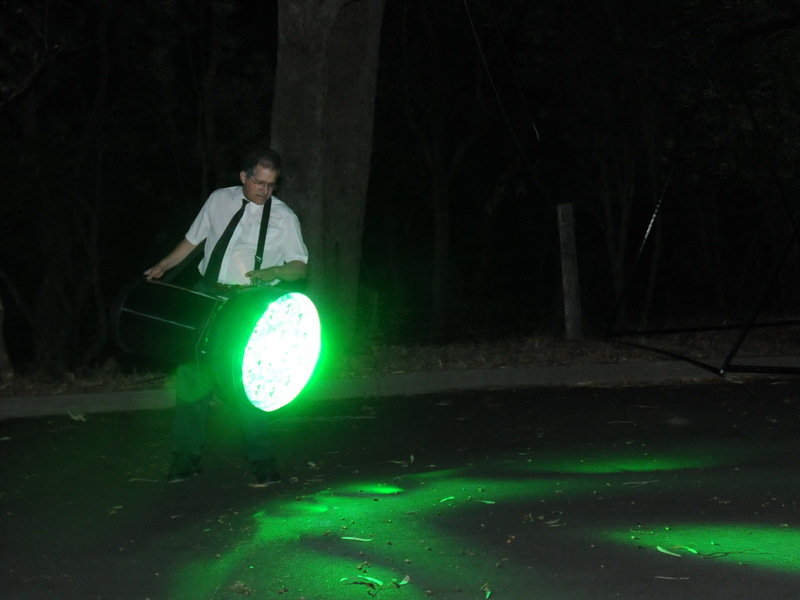 Peter explains that he has used the latest modern light emitting diode technology. These LEDs are a huge 100 watts each and he uses 18 of them, each with it's own cooling fan. The resulting 100,000 lumens of light power is many times more powerful than any other bike light and is being considered by Guinness World Records. 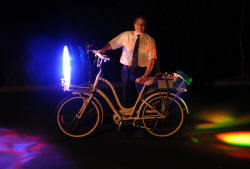 Put another way, it is like having 5000 small LED flashlights on your bike. But hey, there's more! 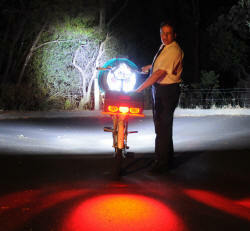 Peter has included coloured LEDs to enable any combination of colours from the front or rear lights. It seems like it has attracted a jolly visitor in a red suit from up North to take it for a spin. Well, we thought we'd seen it all but this is just bizarre. 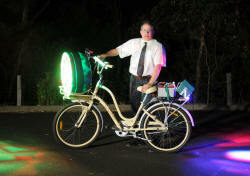 Dr Peter Terren is normally better known for his dazzing high voltage electricity displays shown around the world. 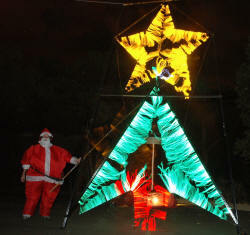 He's even made some dramatic Christmas trees with lighning like sparks. But, this year he decided to put a Christmas tree on a bicycle. However this is no ordinary bike. This one has a lighting system on steroids. It is far too bright to go on roads and is about 10 times the brightness of your average family car's high beam. He does this with the latest light emitting diode technology - we know them as LEDs. These ones are huge and 18 of them draw 1800 watts. Peter says the massive current draw means battery life is not good. Three deep cycle industrial batteries last about 10 minutes. I usually keep a spare clipped to my belt he quips. (at 33kg we think that sounds unlikely). 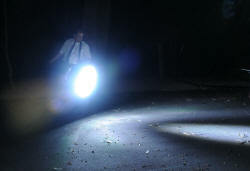 Calculations show that these bike lights would be able to be seen from space with the same intensity as a bright star. "I would love to send some morse code to the International Space Station"
So, why make something like this? Peter say he likes to push the boundaries and this project fitted in with his electrical experience and capabilities as the new technology became available. 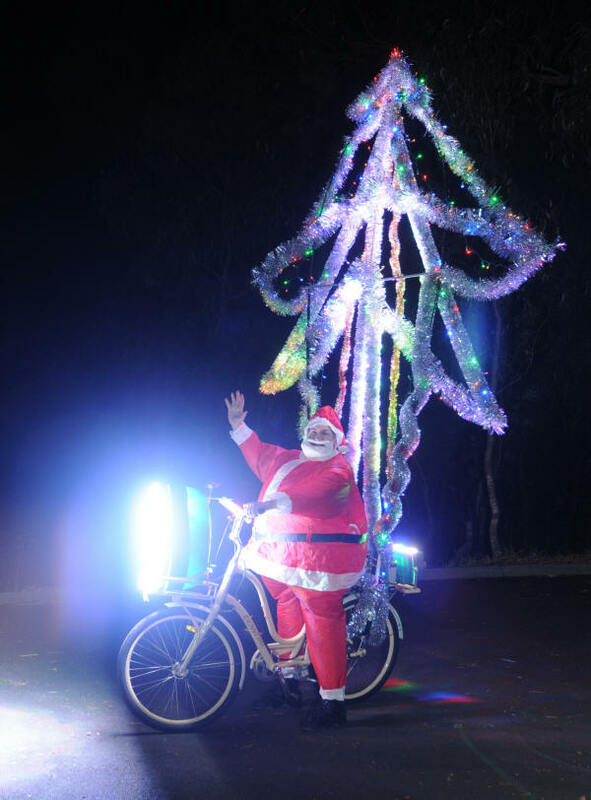 He also rides a bike at night which gave him inspiration. "I have had kangaroos jump out in front of me so this gives me the upper hand". 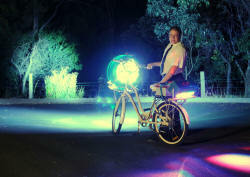 Peter has applied to Guinness World Records for this super bike light. In the meantime he is letting a few people have a ride, like this jolly fellow in a red suit who dropped in. Sample text 3: Topic World's brightest flashlight. Ever had to scrabble around to find a flashlight when the power goes off? 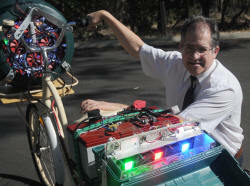 Well, wacky Australian tinkerer, Dr Peter Terren has an answer for this. He has built what he claims is the world's most powerful flashlight. 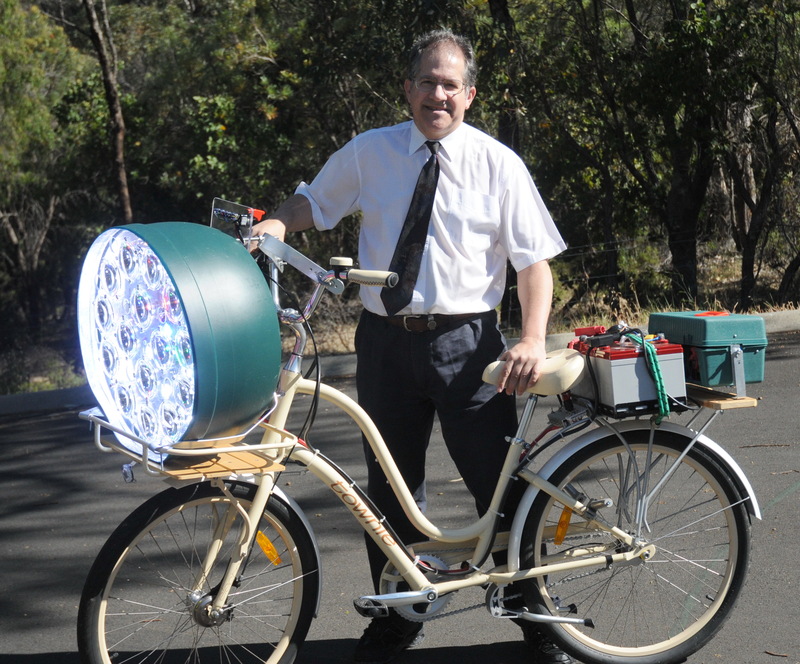 He explains that he used 15 massive light emitting diodes or LEDs. These are the same ones that you know as little coloured lights on electronic equipment. 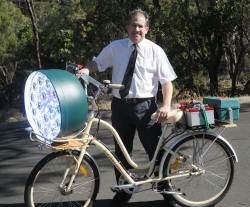 But the big ones the Peter uses are also used as streetlights and each one has a solid cooling fan. And he has 15 of them. This makes up 90,000 lumens and for comparison, a little LED torch is only 20 lumens. All this power requires some 30 kg of batteries and only lasts 10 minutes at 2,000 watts which could supply a whole household of lights. So how useful is it? Peter admits that at 57 kg it's not something you carry around in your pocket. So how bright is it. It is powerful enough to be seen by the International Space Station 300 km high about as bright as Jupiter. 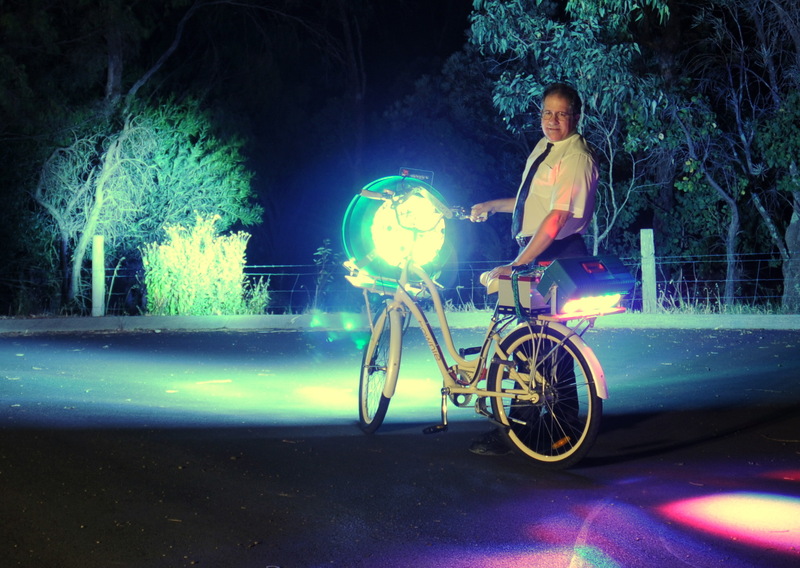 Peter has applied to Guinness World Records for recognition for his super flashlight. Santa approves but thinks it might be a bit much for a Christmas stocking. Santa says: " All well and good but where do I attach the reindeer?". The 2007 high voltage Christmas tree using a Tesla coil was also a hit. The rear lights light up the tree. This test tree looks like a beetle! Car park hoons. 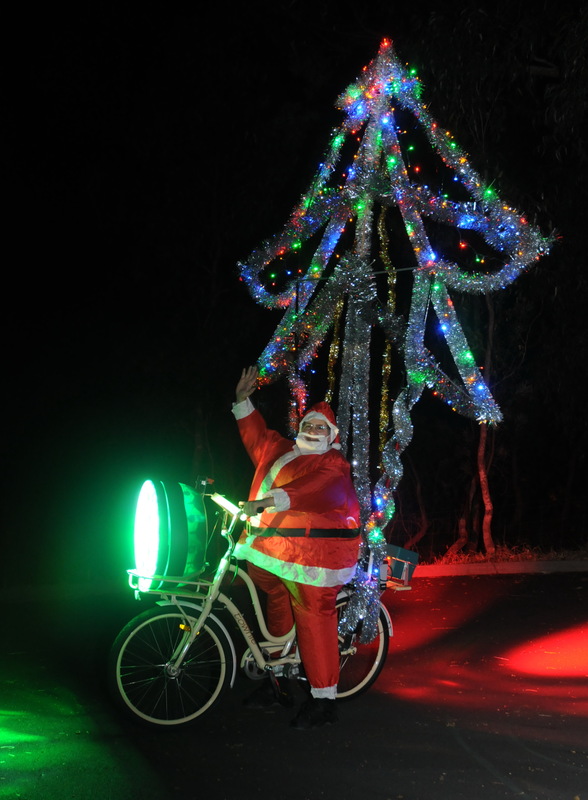 Santa leaves after a brief stop at the local conveniences. Peter explains the multiple colours of his lighting system. Some people carry their lunch. Big and little switches. 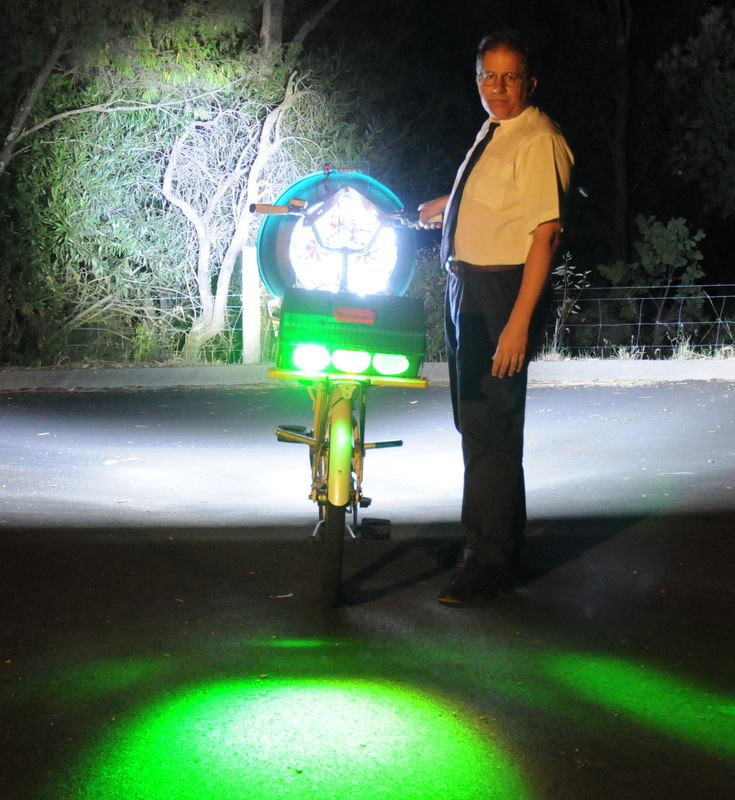 That's my "Townie" Spotlighting for creatures in the park Forcefield On. Set to to "stun". Flashlight - still need better shot showing beam while handheld against white backdrop. Far brighter than a standard car high beam. Comparing ants with elephants. 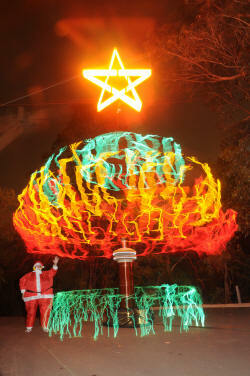 Lighting a lighthouse for Christmas. Yes you can lift it. It's only 57kg after all. It looks like a tiny torch after all. That Aussie flag needs to be lit up.